any alteration of the chimney system or structure, such as a change in the fuel type or appliance, relining, repairs, etc. In accordance with the protocols set forth by the CSIA, a Level 2 Inspection shall include all inspection elements included in a Level 1 Inspection, "plus the accessible portions of the chimney exterior and interior including attics, crawl spaces and basements. It will address proper clearances from combustibles in accessible locations." Additionally, it shall include "a visual inspection by video scanning or other means in order to examine the internal surfaces and joints of all flue liners incorporated within the chimney." 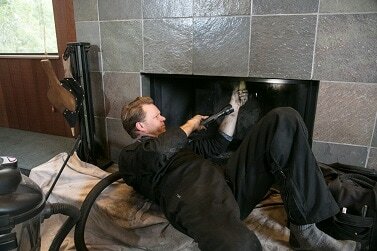 ​Twin Cities Furnace Cleaning partners with Minnesota Chimney Repair Corporation to provide our Level 2 Inspections. MCR uses state-of-the-art Chim-Scan technology to perform these Inspections. ​Photo: This image shows extreme deterioration of the mortar joints leading to complete separation of the flue tiles, which allows combustibles to leak out of the venting system. This process creates creosote buildup inside the chimney chase (the empty cavity)--a potential fire hazard. The remedy for this deterioration would be either the application of HeatShield Joint Repair, or the installation of a stainless steel liner. ​Because it is necessary to do a thorough chimney sweep before a Level 2 Inspection can be appropriately conducted, all of our Level 2 Inspections include a free chimney sweep, which will be performed immediately prior to the inspection.